I have just finished writing a new in depth article about the organ I have been involved in designing: The New Pipe Organ in Jørlunde Church. In the article I talk about the history of the project, as well as the thoughts behind every voice in the organ. It also includes a detailed stop-list, pictures, videos, and music samples. Last year, a publicist set up a Facebook fan page for me but I didn’t get involved in it myself initially. Until January 6th this year that is, when I decided to kick start it by becoming active updating the page. A Facebook Fan Page differs from a Myspace musician’s profile in several ways. Put simply, Facebook “fans” cannot be compared to myspace “friends”. First of all, you cannot add “fans” in the same way you can add myspace friends (that can even be done in bulk). The Facebook users have to find and add your page by themselves as a conscious choice (You can, however, send out invitations to your existing facebook friends, but if you’re like me you’ll have much fewer facebook friends than myspace friends and most of them are “real life” friends, family, and acquaintances). When people become a fan of you on facebook they display that on their profile and in their news feed. Hence becoming a fan of something on facebook is significant thing – a statement for all your real friends and family to see, whereas becoming a myspace friend doesn’t necessarily signify any particular “approval” or interest in the new “friend”. To make a long story short, a myspace “friend” is not necessarily a fan or even someone remotely interested in your music, but a facebook “fan” is most likely a real fan or at least someone genuinely interested in you and/or your music. Yesterday, on October 25th 2009, the new pipe organ in Jørlunde Kirke (Jørlunde Church) was finally inaugurated at a festive mass, celebrated by the parish priest Peter Nejsum who arrived in procession with the Bishop of Helsingør. Organist Gunnar Svensson and I took turns playing the organ. The church was packed to the last seat and beyond (more than 50 extra chairs had to be put in). Aside from the relatively small sized church being packed like that, causing the acoustics to suffer a little, everything went well and the organ itself was very well received. All the stops of the organ were ready for the inauguration, but there is still some “fine tuning” to do over the next week. It will, however, be fully ready for the first concert which takes place on November 8th at 16.00 (4 PM) where I will play some of my own works as well as music by Bach, Franck, Widor, and others. One of the works I will perform is my new Fantasia for organ “To become”, commissioned by the church for the inauguration and given a “preview”-performance at the inauguration mass. It was recorded and you can download an MP3 excerpt from the ending here where you hear the full power of the organ. One of my goals with the organ’s tonal design was for it to sound like a full and complete organ, capable of producing a somewhat larger sound than one would normally expect from “only” 21 voices. Not in regard to sound pressure but rather in the richness and “greatness” of its tone, and I think the organ builders Frobenius and their chief voicer Ole Høyer has succeeded in realizing that as well as my other visions for the organ in the best way. They’ve built a great pipe organ, perhaps not so much in size but certainly in sound. I’ve posted an “essay” with a detailed description of the tonal design and the thoughts behind every voice. I will be working on an English translation, but in the meantime you can find the Danish version, which was the basis for the organ project here. I’ve just returned home from a visit to the construction site of a new pipe organ being build in Jørlunde Kirke (Jørlunde Church) near Copenhagen (Denmark). I’ve been visiting several times a week recently, and will continue to do so until the organ is inaugurated on October 25th. The reason for this is my involvement in the project as organ consultant (along with the organist Gunnar Svensson) since 2004, and creator of the disposition and tonal design. This organ is my “baby” and to see it come to life after 5 years of work is simply an amazing experience. It is being build by the outstanding organ builders “Frobenius” and the intonation – “shaping” of the sound of the pipes – is done by their chief intonator Ole Høyer. He works from my guidelines for the voices (UPDATE, October 2009: Read the detailed description of the voices in Danish (English translation in the works)), and I’m involved in the intonation work myself in that once or twice every week I carefully go through the newly finished voices (intonating all 1304 pipes takes about 2-3 months of work) and discuss them with Ole, sometimes having changes made. I think we have a great cooperation with mutual understanding and respect. And we share the common goal of making this an absolutely outstanding musical instrument, a world class pipe organ in a relatively small but beautiful church. So far about half of the pipes have been installed and 5 voices fully intonated. Four voices in the organ (Tectus 8′, Fugara 8′, Oktav 4′, and Fløjte 4′) are created as tonal “copies” of voices from a Demant organ from 1876 with an extraordinarily beautiful sound, and the rest of the organ is being build and intonated to match those stops. The result will be a organ with a delicacy and richness of tone rarely heard. 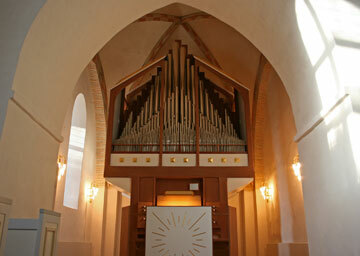 I will post more information, and pictures, on the progress of the organ in the coming weeks and months. Detail of the Console. Ivory keys and case made from massive mahagony. Tuesday I spend the whole morning at the Zoological Museum in Copenhagen (Part of the Natural History Museum of Denmark), armed with various clubs, playing on a wide range of bones. Even an Elephant’s thigh bone (it is huge!). Quite extraordinarily I had been granted access to the bone collection of the Zoological Museum in order to find a bone with the perfect sound for use in the 2nd symphonic poem of »Cantabile«; the »Cortège & Danse Macabre« at the first performance on June 10th. In the »Danse Macabre« I have specified the playing on real bones (! ), but since human bones have too little sound (and probably would be slightly… what shall we say… “improper” to play on), I needed to find a different kind of bone. A bone with sound, but still clearly “looking” like a bone. And, O, did I find that. The Giraffe thigh bone has an amazingly loud, sharp tone. Just what I had imagined when I wrote the piece and specified the use of a bone. It’s big. but not as big and heavy as the Elephant bone by far, so it can be handled by just one person. The Elephant thigh bone would have required the use of two percussionists – one to hold it, and one to play. 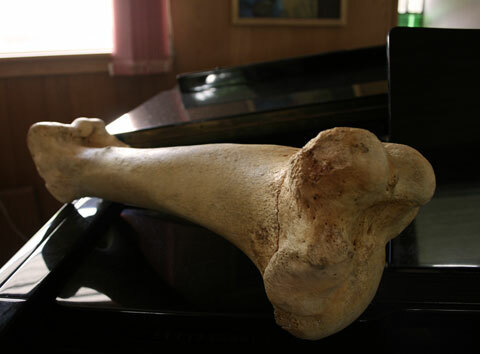 So I ended up borrowing this giraffe thigh bone from 1930. The journey begins in early 2003 with my first meeting with Prince Henrik (the Prince Consort of Denmark), regarding the composition of a large work for symphony orchestra, choir and soloists – using poems from his book »Cantabile« as the text. A journey that would end up taking many years longer than I, or anyone else, would have expected. But in the process I would learn much and in the end it would change my life in many ways. Musical journeys never end, but the journey of Cantabile will reach its originally planned destination with the first performance of the remaining parts of the work on June 10th. (Read more about the concert here). »Cantabile« is a suite consisting of three symphonic poems. I began working on the first poem »Souffle le vent« (Cry of the winds) in the late summer 2003, and finished it just in time for the first performance on June 10th, 2004 at the gala-concert celebrating Prince Henrik’s 70th birthday. Early in 2003 the plan was for the entire work to be performed at that concert, but as the year progressed the plans were changed to only include »Souffle le vent«. part of the reason for this was the orchestra’s very tight schedule in the spring, but this was fine with me giving me time to focus on getting the first poem just right. The first performance of »Souffle le vent« was indeed a milestone for me, and the premiere went very well with Thomas Dausgaard conducting the Danish National Symphony Orchestra (DR SymfoniOrkestret) and chorus. Excerpts are available as downloads. An old friend of mine, the violinist Nikolaj Znaider, called me today and asked if I would do what can best be described as a »cameo« performance tomorrow evening – the 16th. Nikolaj is giving a concert performing as soloist, as well as conducting, among other works Fritz Kreisler’s »Concerto for Violin & Orchestra in C Major – in the style of Vivaldi« with his »Nordic Music Academy« Orhcestra. It so happens that this concerto includes a part for organ, so I’m jumping in and will play it. I don’t have the score or organ-part so I’ll do it prima vista at the general rehearsal tomorrow, but it shouldn’t be difficult to play. Tomorrow – May the 4th, 2007 at 20:00 hours – my Variations and Theme »Journey in Time« for violin and piano is going to be performed at the Conservatorio Superior de Música “Rafael Orozco” in Córdoba, Spain by an excellent violin and piano duo consisting of Encarnación Almansa (violin) and Javier Santos (piano). 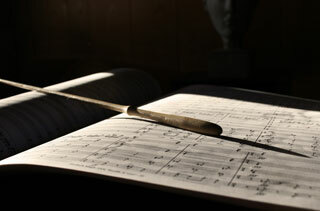 See the current list of concerts at the Córdoba Music Conservatory (in Spanish). Besides my work, the duo will perform works by Schubert, Debussy-Heifetz, and Anatoly Varelas. I cannot attend the concert myself but I will be looking forward to hear how it goes – hopefully very well! :-). I wish Encarnación and Javier all the best for the concert tomorrow and send my appreciations for them performing »Journey in Time«! 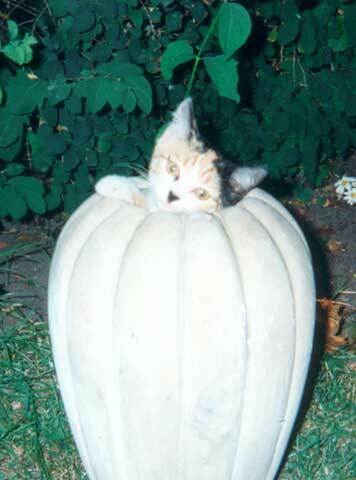 On the 27th, the day before yesterday, my beloved cat Smilla died from liver cancer. I’ve written a post about her here.